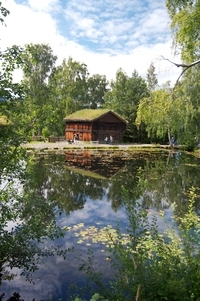 at about 14:30 we arrived in the olympia town of 1994, lillehammer. lillehammer itself is a rather small town, and the legacy of the olympic games 13 years ago is still everywhere. and of course there's the olympia park with all the nordic sports things like ski jumps, ice-arena, etc. but we preferred the maihaugen open-air museum instead. this museum was founded by a dentist that started to collect various things, like houses, and put them in his garden. soon he lacked space for more houses, so the things were transferred to maihaugen. today there are 150 old houses on 40 hectare. 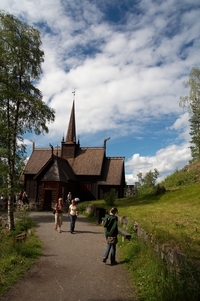 it is divided into several parts, ranging from old rural farm houses, a stav church, a vicarage, and small fishing shacks in one part, to modern buildings in the other part. the most shocking things was an original house from the 1980s. at the entrance door a museum guide, dressed and styled in 80s look, was welcoming us and guided us through the basement of the house. it was as a time-journey, since so many items were familiar to me. i was so impressed, i forgot to take pictures. another part was dedicated to lillehammer from about 1930. original houses like a pharmacy, the post-office, a hairdresser, a bakery, and much more were shown. we left the museum at 17:00, because they were closing it. after spending hours in this really awesome museum we drove on to oslo, about 200km away from lillehammer. just one word about distances here in scandinavia (especially in norway), just in case you wonder why it takes us so long to get from one point to another: the maximum speed is 80, there are no highways. only occasionally the limit is 90km/h, more often the limit is at 60km/h or 70km/h. this results in an estimated duration of e.g. 7.5 hours for 500km, and tomtom does a generous calculation. especially the roads along the fjords are very steep and curvy, so with the camper we rarely drove the maximum speed. but the good thing about the speed limits are, that all kind of vehicles driving, from campers to trucks, are (in theory) able to go at that speed. additionally scandinavian people really drive disciplined (except for some bad manners of mercedes drivers, that seem to be independent to country and nationality). i think the limits make sense, especially in winter, and during summer one can at least enjoy the environment scrolling by - just as we do.